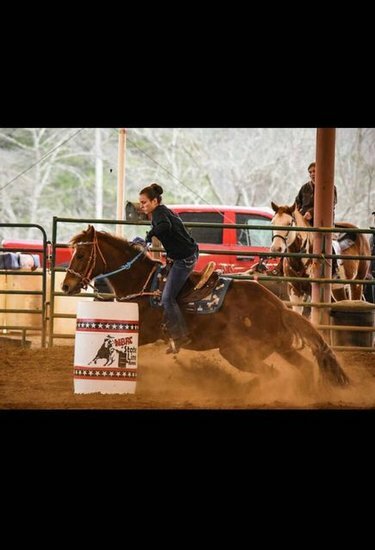 Ringgold High sophomore Claudia Lewis has been riding horses since she was in fifth grade. She has loved horses even before the fifth grade, though. To her, horse riding is a way to “de-stress from the day.” We all need a good stress reliever and what better way to do that than what Claudia does: riding and getting in touch with nature? She admits that horse riding can be a very dangerous sport, though. Her worst accident was nearly breaking her ribs in one instance, and in the other coming close to a broken hand and a concussion. Claudia has trained with three personal trainers. She said she’s come a long way from where she began five years ago. One of Claudia’s greatest riding strengths is the fact that she is unafraid of the horses. She admitted, though, that it could also be her greatest weakness because she’s so comfortable riding that some might say she is blind to the danger in a way. Claudia’s typical day after she gets home is very busy. She tries to finish her homework as fast possible so she can go feed and ride the three horses she owns. When she gets back in, it is usually dark. That's when she finally eats her dinner. Claudia loves riding, so she says that having such long, busy days is worth it to get to do something she loves.